Contact with Lester Anthes, of Niagara, Canada, in the late 1970's revealed that his ancestor, Michael, migrated to Canada around 1820 from Alsace. He suggested that there may have been a migration to Canada one or two generations earlier and that some families had since settled into the United States. Lester advised that the father of Michael had been killed at Waterloo, fighting for the French forces of Napoleon. he thought that his ancestors were German speaking and that there was a family crest of three swords tied by a green ribbon. Outside the family groups in Australia, descended from Jacob and Friedrich, are William James Day Anthes and his wife Janet who reside in Sydney following their migration in 1971 from the United States. 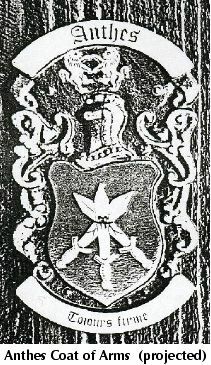 Ancestors of William were Huguenots (French Protestants) who migrated to Canada and later moved to the U.S. His father, also William James Day Anthes, holds his family records and the d'Anthes seal. William mentioned also that successive male members of his family have worn an Anthes signet ring and that they have a family crest. An indication of this comes in a description or arms from a book of heraldry, written in french, and using heraldic terms which, literally translated, notes : "Anthes: Alsace (about 1731; barons) red background, three silver swords, embroiled with gold, two crossed pointed downwards and the third, in the centre, pointed upwards, placed on the other two. These swords are tied together with a ribbon 'de sin'. Symbol : two gold lions. (George Charles, baron d'Anthes took in 1833 the name and symbols of Heekeren and was included in the Netherland nobility in 1836. The meaning of the words 'de sin' is not yet known with certainty but may be an abbreviation for the heraldic word 'sinister' meaning left. This perhaps would indicate that the ribbon was tied on the swords to the left, regarded from the bearers point of view, rather than knotted in the centre or to the right. it is most probable that a variation to that description of arms exists in other books of heraldry or that a similar family crest was taken by another Anthes family in Alsace. One noted variation describes the arms as "Red, three silver swords, two crossed and one perpendicular with points upwards, gold handles, tied with a green and blue (vert and azure may also mean grey-green) ribbon". The symbol or crest is described as: "Two gold lions rampant and combatant" and the motto is described as "Tojours firme". The motto is more likely to be spelt "Toujours Ferme" in accordance with the modern French spelling which means 'Always firm' or 'Always reliable'. The portrayal of the swords on a coat of arms usually signifies military honour while the use of the colour red, as in the crest background, can indicate a royal connection. It may be assumed that the Anthes families of Alsace aided a higher noble bby support of arms either in a political or religious struggle and the elevation to nobility and consequent grant of arms was in recognition of that support. One can only speculate that the person or family elevated to baron, the lowest rank of nobility, may have been landholders or the holder of a high military position at that time. It would be interesting to compare the version of arms held in the United States, and its history, with that of the one prepared by a local firm using book references.